Years ago when I was first introduced to the classical method of homeschooling, I was determined to have my boys attempt a Latin program as suggested in The Well-Trained Mind. We tried two different programs to learn Latin. We got a little farther with a DVD based program, but we still were not able to stay motivated. I know I had a bit of a bad attitude about Latin and at some point I made the decision to set it aside and learn Spanish instead. I thought in our family that Spanish would be more applicable and practical. It was a great decision. We have not totally ignored all Latin. 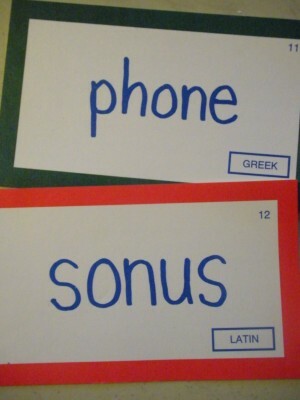 We have used English From the Roots Up as the basis for our very simple Latin and Greek roots curricula. Why do we even bother learning these roots? I have found that my boys are able to easily decipher the meaning of an unfamiliar word by looking for roots within the word. 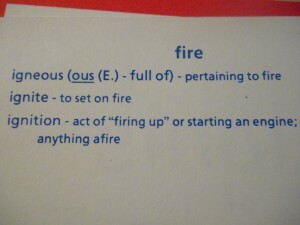 For instance they can remember what igneous means because they see the root ignis, meaning fire, within the word. 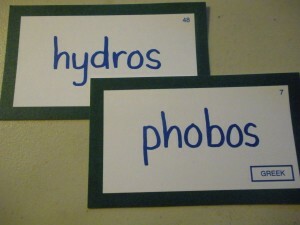 Another example would be the word hydrophobia with hydros meaning water and phobos meaning fear or a fear of water. Learning the Greek and Latin roots has been especially helpful in their study of high school level biology. 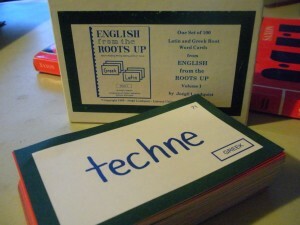 We started off with the English From the Roots Up book and the flashcards but what has endured to the end are the cards. The box set comes with 100 pre-made cards with the root on the front and the meaning and some vocabulary words on the back. We took the roots very slowly, discussing and learning each root one at a time. When I say slowly, I mean it has taken us four years to cover the box of one hundred Latin and Greek roots. Taking the slow approach has allowed my boys to learn and retain every root in the box. I would not hesitate to start using these cards even with young children using this slow approach, keeping it light and fun. We used the cards each week to drill the roots into our memory. We played simple games with the cards if we had some extra time during the week. We studied five minutes a day, four days a week. Of course I could have made up my own cards with markers and a good list of roots, but I know that I always am more motivated to stick with something if I don’t have to produce the foundation myself (some might call that lazy). It is much easier for me and well worth the money to purchase the box and have the roots all lined up for me with no preparation on my part. I highly recommend this system for learning Greek and Latin roots the simple and easy way. Please note: You can use the book without the cards. The book gives you instructions for making your own set of color-coded cards to study with each week. The book also has additional activities to reinforce the roots in your child’s mind. Written by Barb-Harmony Art mom. She also blogs at http://harmonyartmom.blogspot.com and her business is found at http://www.harmonyfinearts.com. I would love for you to join us for the Outdoor Hour Challenges: http://handbookofnaturestudy.blogspot.com. I have been considering these for part of my [now public school] kids SAT/ACT prep in a year or two. When we homeschooled we went the Latin route–I think this is more what we should have done, since the only Latin they seem to remember is “Oremos” [spelling??] or “Let’s Pray”!! We say it each night at the table…. .-= Lisa´s last blog ..Florence Nightingale’s pre-CM education =-. I have written about The Easy Spanish program right here on CC. Take a look. The only other program we have found helpful is Rosetta Stone. Oh, wow. This sounds good. I have some root word resources in my wishlist. I need to see if this is of them. I like your approach too — slow and steady, like the tortoise who beat the hare. How many of us get gung-ho and burn out too soon? .-= Jimmie´s last blog ..Theodore Roosevelt President Study =-. You surprise me because you were someone I would think would just make up your own cards. You are always so creative and make your daughter’s learning so fun. I have these flash cards. Do I need to buy the book also? Unfortuantely, I’ve tried to find your review of The Easy Spanish program and can’t. Can you help me? Thanks!